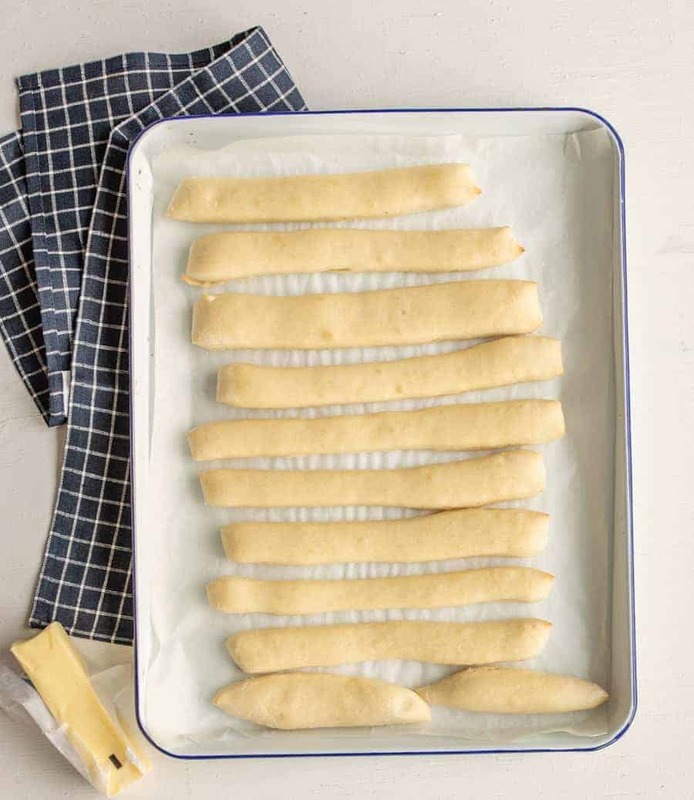 Light and fluffy breadsticks that are easy to make, easy to cut, and easy to shape; a perfect simple side dish to add to any meal. I make pizza most Friday nights and always hope to have enough leftovers for lunch the next day. If I just make pizza, I don’t always end up with enough to feed us again, but if I make breadsticks, I can get two meals for the effort of one! I’m all about that kind of arrangement. Breadsticks are all about timing, in my opinion. I bake the first pizza, then the bread sticks, and then the second pizza. If we are still hungry after the first pizza, the breadsticks get munched on, and by the time the second pizza is out of the oven everyone is full. Hurray for leftovers! This is the same dough recipe that I use in my perfect pizzeria-style crust recipe. I seriously use this dough all of the time! The dough makes 2 large pizzas or 1 large pizza and about a dozen bread sticks. I normally double the recipe and make 2 pizzas, breadsticks, and cinnamon sticks (recipe coming later this week!). I like to store them in an air-tight container at room temperature for a few days and in the fridge for up to a week. Can you freeze bread sticks? Yes! I have found that it’s best to bake them, let them cool, store them in an air-tight container, and then pop them in the freezer. Store in the freezer for up to 2 months, let thaw, and then warm them up (microwave and oven both work). I don’t like to freeze the dough to bake later. I don’t have good luck with frozen dough rising and getting fluffy. Don’t fear the yeast bread! Just knead it and work with it until it’s soft and tender. It shouldn’t be sticky. Once it rises, just roll it out and cut it. 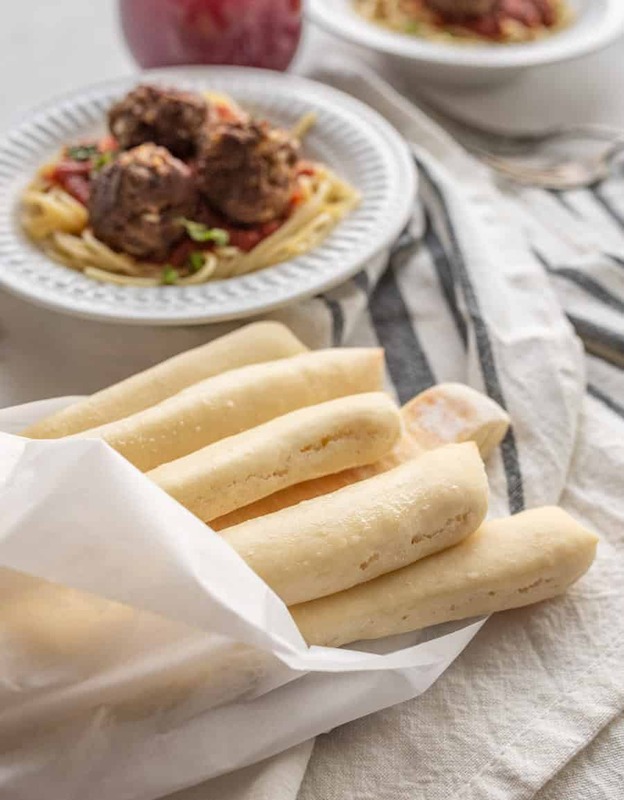 You can roll it out and cut it right on a baking mat or on parchment paper OR you can roll and cut the bread sticks out on your counter top and then simply pick up each bread stick and transfer it to a baking sheet. Both are great and easy options. My mom rubs the tops of the hot breadsticks with butter when they come out of the oven and then sprinkles them with a little Parmesan. So good. Fill up a small measuring cup with a little warm water. Add 1/4 teaspoon of your yeast and then add a pinch of sugar and lightly stir it together. Wait for 5 minutes. If the yeast is still active, you will see little bubbles along the top of the water and it will start to foam. I think the date on the yeast package is a good guide, and I like to store my yeast in the fridge to help keep it fresh. When in doubt, get new yeast. Nothing is worse than an unrisen loaf of bread because of old yeast! Add one cup of flour and mix to combine. Add another cup of flour and mix through. Mix for 1 or 2 minutes. The dough should be the consistency of cake batter. Add another cup of flour and mix through. Add flour until you can’t mix it by hand very well. Sprinkle some flour on your table and turn the dough onto the table. Knead the dough by hand until it is smooth and elastic, adding flour as needed. This should take 6 to 10 minutes of kneading. Place the dough back in the bowl, cover it with a towel, and let it rise in a warm place for 15 to 60 minutes (this time varies a lot for me, I just let it rise according to how long it is until dinner time). Preheat oven to 400 degrees. Divide the dough in half. Use one half for a pizza and the other half for breadsticks or use both halves for breadsticks. 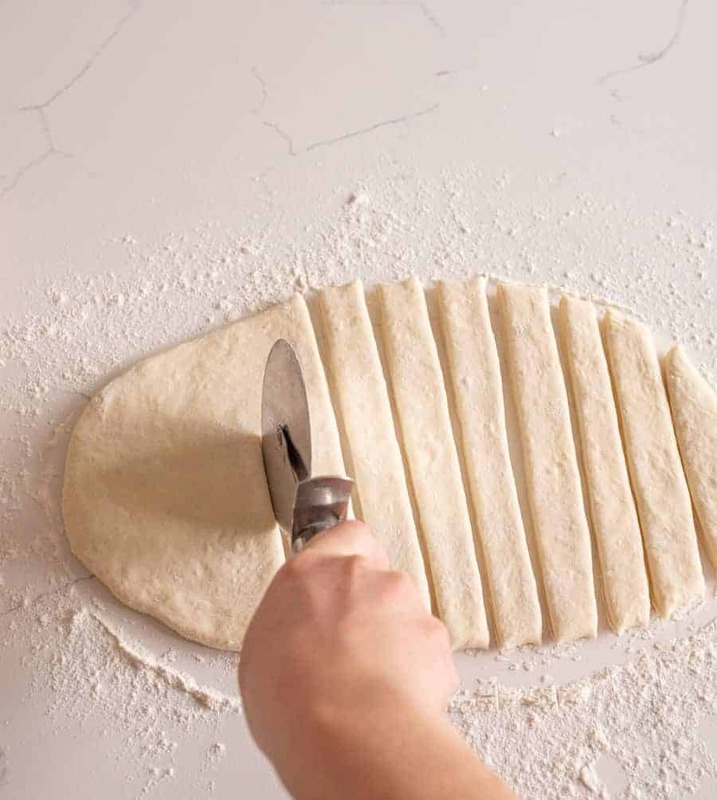 Roll the dough out on a piece of parchment (about a half inch thick) and then use your pizza cutter to cut the dough into 12 strips (about one and a half inches wide). Slide the parchment onto a baking sheet and bake for 12-15 minutes until the bread sticks are light brown. If the bread sticks stick together a little, just re-cut them after they have baked. Serve hot with your favorite dipping sauce. 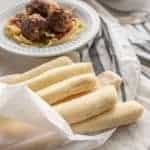 You can roll it out and cut it right on a baking mat or on parchment paper OR you can roll and cut the breadsticks out on your counter top and then simply pick up each breadstick and transfer it to a baking sheet. Both are great and easy options. What can you serve homemade breadsticks with? This is one of those recipes that I make again and again and I’m so excited for you to try it. Don’t need 24 bread sticks? Just cut the recipe in half; it’s an easy one to scale up and down as needed. The breadsticks look great. What is that dipping sauce? 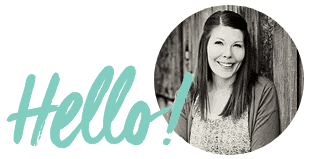 Hi Melissa…thanks for all the wonderful recipes. I’m new to clean eating and your blog, so forgive me if you mention this elsewhere, but what is your preferred flour? I notice in many of your recipes you simply say “flour,” so I didn’t know if I should assume simply ww or a different kind? Also, I’m assuming when just yeast is stated its active dry yeast and not rapid rise? Thanks for your help! Thanks for asking Morgan! If I use whole wheat I probably tell you, or I’ll mention it in the notes of the recipe. I get nervous making everything WW because I’m afraid people won’t make it, so I normally have tried all the recipes using both. The bread sticks that you have commented on are definitely ones I make whole wheat 90% of the time. I grind my own white wheat berries so I have the equivalent of white whole wheat flour or whole wheat pastry flour (I like a fine grind), both of those you could buy but they are bit nicer to work with than just traditional store bought whole wheat. I use rapid rise but I have used active dry a lot. I prefer the rapid rise because I think swear that the active has an after taste that no one can taste but me, but it bothers me. But as far as rising go, both work well. Does that help?! ENJOY! Well if you are eating clean to lose weight that might not help, but if you are eating clean to overhaul and do a lifestyle change than you SO need those cookies (they are totally party of my 80/20 rule!) They will be the most amazing cookies you’ve ever eat. Guaranteed! Good luck girl and feel free to contact me. I love this topic! Can you use this for garlic breadsticks? If so how? If we want them garlicy I’ll just melt a little butter and throw in some garlic powder and then brush that over the cooked bread sticks when they come out of the oven. EASY! My kids love cheesy bread whenever we order pizza (and cinnamon sticks). 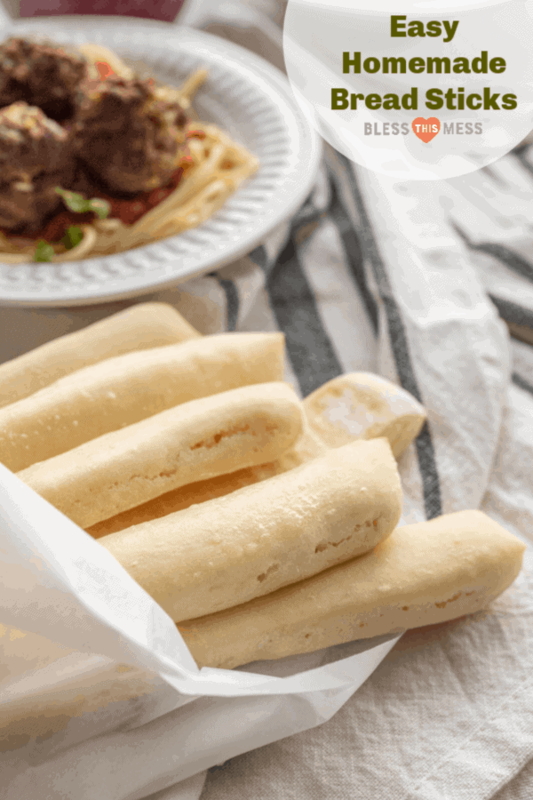 What do you think the best way would be to make these delicious looking breadsticks, cheesy inside breadsticks? 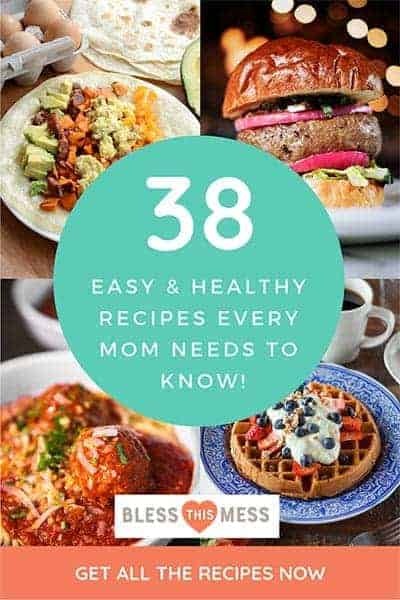 Just discovered your blog and I can’t wait to make some of these awesome recipes! Hmmm. The most I’ve done is add some Parmesan on top but that sure isn’t pizzeria cheese bread. Did you try it?! I’d love to know what you did because my kids would LOVE cheese sticks! Such an easy and nice recipe, perfect with some dips when having guests. It is funny, you said that you always make pizza on Fridays. I don’t make it every week, but when I do make pizza then ALWAYS on Friday. 🙂 No idea why, I have never purposely thought about it, I suppose Friday just seems the right day to eat pizza. What is it with pizza and Fridays, lol. Same here, it always seems to be on a Friday! Happy homemade pizza and bread stick making!